The final LP from one of the 60's & 70's greatest progressive rock/blues bands, this forgotten masterpiece is an important footnote in Armageddon's pre-history. Largely an instrumental outing (vocalist Kieran White had just left the band – Garth Watt-Roy from "Fuzzy Duck" contributes some lead vocals, and Keith and Jane Relf offer up some support vocals), it was recorded sporadically (between live tour dates) throughout 1971. The genesis of Armageddon occurs here, as Louis Cennamo's former Renaissance bandmate Keith Relf was on hand to help with the production chores - you also get to hear Martin Pugh's standout guitar riff from "Buzzard" about 3:20 in to the first track. Competing with bands like Led Zeppelin, Pink Floyd, Deep Purple & King Crimson for the then current listener's attention - this record is a vivid illustration of just how musically advanced this band was. No shortage of complex arrangements, haunting melodies, gutsy blues and very heavy-handed rock...there is something here for almost everyone. The one downside of the record may have been, for the record-buying public, the very infrequent use of lyrics and vocals on the album. Originally released only in Europe (where Steamhammer was extremely popular) in early 1972, it was re-released on CD by Germany's Repertoire Records in 1991. Unfortunately, drummer Mick Bradley died of lukemia just prior to the release of "Speech", so sales suffered as limited touring followed (they did assemble a new drummer and added a vocalist for touring later in the year, but it wasn't enough to keep the band together) . Mick's contributions to the "Steamhammer Sound" were quite significant, and he has some really bright moment on this album - Martin Pugh recalled to me once that: "Mick was a world-class drummer...his solos brought down the house every night single we played". Get yourself a CD copy here on Amazon.com . Louis Cennamo in "Big Bang"
1) Keith Relf and Clapton had been bandmates in The Yardbirds - after ten years of going in different musical directions, it might be interesting to see them reunite for a big tour. 2) It may not have been a perfect match to have Armageddon as an opening band (listen to the Armageddon album, then put on "461 Ocean Boulevard"). At that time, Clapton was re-inventing himself as an artist, favoring more of a singer - frontman role. It seems that Eric had been greatly influenced by his associations with George Harrison, The Band, and Delaney & Bonnie, and this was reflected in his music circa the mid 70's. Unfortunately, for still unknown reasons, it was decided at the 11th hour to cancel the tour. Without a doubt, a tour of this type would have sealed their fate as rock & roll legends. But as Martin Pugh said recently "We were anxious to go on the road, and a tour with Eric certainly had great possibilities for us. 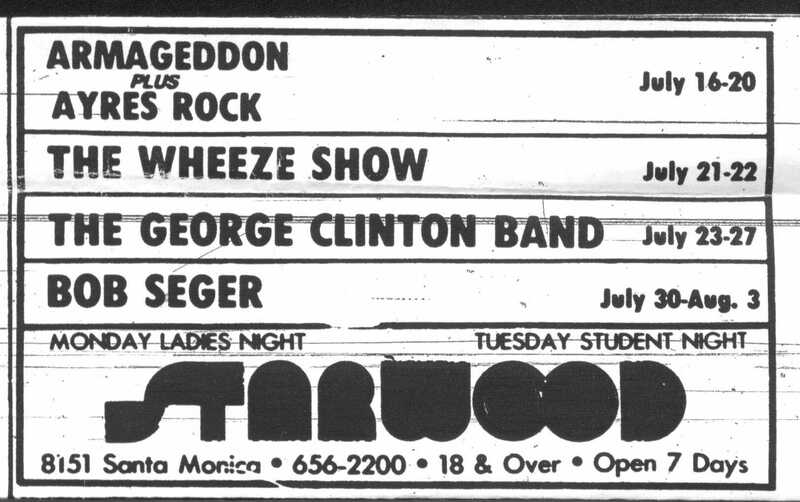 But in retrospect, Armageddon was not an opening act anyway - we really were a headlining band". In a 2001 interview, drummer Caldwell mentioned that the band's management became increasingly more difficult to communicate with - consequently they were not being promoted properly. Bassist Cennamo stated in liner notes of the CD re-release of the album on the Repertoire label in 1999 that drug problems had created difficulties within the band - which apparently ran at cross purposes with the fact that the record received good reviews and significant FM radio attention, and was selling reasonably well. Cennamo also states the band had dissolved many months prior to the sudden death of Keith Relf in May 1976. After Armageddon folded, bassist Cennamo reunited with a few of his Renaissance bandmates to release a few albums under the name Illusion, and drummer Caldwell returned to Captain Beyond for an album and tour. Guitarist Pugh appears to have retired from music after 1975, but he did emerge to play guitar on sessions with friends Daniel Jones and legendary American rock guitarist Geoff Thorpe (of Vicious Rumors) in a Hawaii-based rock & roll band, 7th Order, on their debut CD, The Lake of Memory - released on the Big Island Sounds label in 2007.